Oh My! This bag is completely empty. But not bad empty like empty promises, but more like good empty like someone emptied the dishwasher. Caution: side effects may include selfishness, going nuts, smiles, laughing, yummy in your tummy, and repeatedly saying "Oh My!". Please consult your local Trader Joe's before starting a new Nut program. 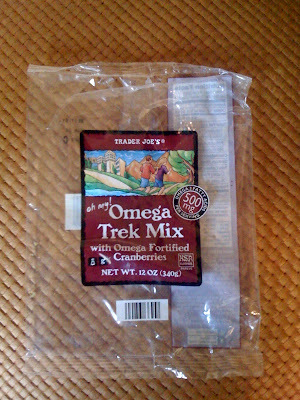 Call me skinny, but I've been going nuts for another bag of Omega Trek Mix ever since I emptied this one into my mouth...Oh My! Most of heir mixes can be considered my favorite. But I LOVE the 'temping trail mix', 'peanut butter and jelly' and 'perk me up.' I think I could live on those the rest of my life. Have you tried the fiber cakes? I love the apple cranberry ones. Highly recommended--muffins with TONS of fiber and very few calories. What more could a girl (or boy) want?